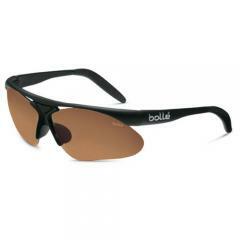 The Parole G-Standard PLUS Sunglasses from Bolle are packed with features that make them a go-to item for tactical eyewear. The semi-rimless lenses deliver a wider field of view, allowing rapid assessment of any situation from all angles free of glare. The light, polycarbonate lenses provide all-day comfort, while the high-impact nylon frame stands up to the rigors of daily wear. Paired with Bolle's Optics Control System, the Parole's lenses can be customized to provide the best vision based on varied lighting conditions. The sunglasses are designed for a small to medium fit.